DeforestACTION Software Launch – Register and Learn More | Collaborate for Change! In an earlier post, I explained the idea of how young people around the world could collaborate to save the rainforests, inititally in Indonesia, using satellite monitoring. On July 27th, the genius team at Geodan, lead by Dr.Eduardo Dias, will join Dr. Willie Smits, Dr. Cathy Henkel and young people from around the world for the launch of the technology that will make this dream a reality. If you want to join the live webcast of the launch, register here! It will be fantastic for teachers, students and anyone who cares about the future of the planet. The following explanation and outline of this ground breaking software is a re-post from Dr.Eduardo Dias’ personal blog. DeforestAction EarthWatchers: Empowering world citizens in tropical forest monitoring via the integration of Earth Observation, social media, human computation and collaborative intelligence. Among other objectives, students will be able to monitor rain forests via specially designed (web)tools and satellite imagery to provide near real-time intelligence required to halt illegal deforestation. The project will start as a pilot in the province of Sintang, West Kalimantan (Borneo Indonesia), where agreements are established with the local community chiefs and the governor who support this project and offered their executive power to take ground action in stopping illegal activities. Threaten high-value pristine forest in Borneo was split into millions of unique small cells, and each cell can be allocated to unique participants (youngsters all over the world called EarthWatchers) who monitor it as new satellite imagery becomes available. When they suspect changes/cuts in the forest they will report it in the web system and, operating in a crowd-sourcing approach using social media Facebook , all participants can confirm/dis-confirm. The most suspected areas will be visited by a special team on the ground to prove the suspected activities, report back to the EarthWatchers and involve the local executive power to stop the illegal activities. This project is unique as it is the first to involve human computation and collective intelligence in the analysis of SAR imagery: while optical data can easily be understood by untrained users (our target group), especially true for “true color” and “natural color composites, the same ease-of-understanding is not usually a characteristic applied to SAR data, where specific expert knowledge and sophisticated processing techniques are needed to derive useful information. Nevertheless, we propose to use the untrained (and unconditioned) spirit of the children (that is free from academic assumptions) to explore the SAR data and we expect that they will uncover patterns and fine issues that might never be uncovered in automated efforts. At the same time, the children will learn about the background technology and potential of SAR earth observation, multiplying the understanding, market and target base of SAR users for the coming 5 to 10 years. The webgis is also meant as a powerful classroom support tool, as it will make available and accessible many other GIS layers (infrastructure, DEM, oil Palm plantations, biodiversity indexes, socio-economic factors) so that the students not only watch the land, but actually understand the inter-relationships that are playing a role in deforestation. Negotiations are ongoing with education ministries (e.g. Australia, Indonesia, the Netherlands) to make this tool and materials part of the standard curricula. I’m by no means a GIS expert, but isn’t satellite image analysis mainly but advanced statistics, something a computer can do far better than the human mind? Several parties are already monitoring Borneo in real-time (Sarvision being but on). What added value is achieved by “outsourcing” this to human minds? Also, this monitoring doesn’t address the underlying issues: defining (il)legality and on the ground (law) enforcement. It is one thing to identify an “illegal” activity from the lazy chair, but a whole different exercise to spend 1-4 days (one way) to get to a spot and verify what happened (and who did it). Great questions. Thank you for following this project. The reality of GIS technology, and computer processing is that even the world’s greatest supercomputer is unable to do what humans can do when it comes to detecting changes on radar images. What we are implementing with Earth Watchers has a number of significant advantages over any automated systems that exist to date. There are strong and current precedents for using crowd sourced analysis to achieve incredible results. But to keep it brief: for most of the year, Borneo is shielded from optical satellite cameras by a thick cover of cloud. Much of Borneo is of little interest to satellite data providers, so the few images that are available are often partially covered, or very low resolution. For that reason, radar images are the only option – they can see through cloud. To develop a computer algorythm to look for changes that are not related to flooding, unintended fires, seasonal disruptions etc, would be extremely difficult. To find a computer that is capable of processing the millions of images per week at the resolution required, would stretch even the biggest ‘cloud-based’ (pardon the pun) supercomputers. And, it would cost millions. To give you an indication of the processing required just to do it this way – just with the area of West Kalimantan, we require 3 Terrabytes of Azure hosting per MONTH. That is enormous for a cloud driven solution without processing. The role of the EcoWarriors in this part of the project is to be the eyes and ears of students around the world on the ground in Borneo. To make them feel connected to the problem, and to take a level of empowered action. When the students report illegal activity, the EcoWarriors can fly the “Flying Dodo” (an amphibious plane – and yes, one of the Eco Warriors is a pilot) or our remote control drone, to take high resolution images of what is really happening and support local authorities with this information on their behalf. You can learn more about the theory here. Can it work? In the trial project it stopped a large illegal logging project from continuing. I guess we will find out how much land we can save and how much of a dis-incentive this presents to logging companies when we move from beta to production in February 2012. Fingers crossed we can make a big difference. 2. Create global visibility and transparency around the extent of the problem. 3. New forms of cooperation with the Indonesian Government will be possible increasing accountability and linking value to working for the global good. The more people who understand the problem the better. Illegal logging (75% of logging in Borneo) has been easy in the past because it hasn’t been quickly detected and reported, but mostly because it has been done in silence, with specific no exposure, and little or no accountability. Earth Watchers is a great tool to help young people make the connections from their homes and classrooms. The more people who are motivated to take action and to care, the better. This is an empowering and simple way for people across the planet to become more than disheartened spectators. One of the big things in our favour is that we have commitment from various levels of government to take action on areas reported and confirmed as illegal interference. Perhaps they will backflip on this. Who knows? It’s much harder when you have the eyes of the world watching to see if you’ll make good though. And even harder again when young people around the world are holding you to account with very public and visual evidence. Remember, this whole project was established by school students for school students who wanted to collaborate to stop deforestation. It’s no good waiting for the UN, G20, G8 or other beaurocratic organizations to fix the problem. Things are getting worse every day despite the endless announcements and forums conducted regularly to ‘address’ the problems. Anyway, we are always open to new ideas and suggestions that will help students take meaningful action, execute new, bold innovative ideas, and have increased control over the future of the planet they inherit. Better still, why not connect with your local school(s) and ask the students there to propose new ideas. We are constantly amazed and impressed by their ideas, and continue to work with schools daily to incubate and execute their solutions. Thanks for the reply, Sean! Perhaps you can provide some higher resolution pictures in that link? The radar(?) images presented are grey blurs, while the human mind likes a “black and white” perspective and few are attuned to the finer shades of grey 😉 . Spending a lot of time on the ground in Borneo, I strongly disagree with your statement that things are getting worse every day! Yes, a lot as to be done to make things picture perfect, but things are moving in the right direction. The government was highly effective in reducing illegal logging around 2003-2005. It is important to acknowledge these small successes and learn from them. I’m not sure exactly which images you are after? Do you mean the radar images? Radar images are typically black and white. Fahrani is one of the EcoWarriors. She is an Indonesian National and speaks Bahasa. She is wonderful with kids too. We’re in the process of creating a number of resources for Indonesian Schools. There is no charge for any school to participate in any of the activities or projects. – we will directly contribute to the education effort and raising awareness of deforestation issues and earth observation technology by involving the students in this real data project. be generated in automated analysis. Thanks Sean, send me a link to those resources when they are ready and I will pass them on to schools here. Still confused though… you’re gonna have kids stare at small squares with grey blurs (https://seanspeak.files.wordpress.com/2011/03/ew-monitoring.jpg?w=423&h=242) to monitor deforestation? Eduardo, it looks like quite a spectacle: education and awareness raising, citizen empowerment and unexpected results. But what are the expected results on deforestation and local communities? There is much hope for the Earthwatcher software. Some outcomes could be easily quantifiable, other outcomes less so. Awareness raising is hard to gauge and apply a value to, but is important. Every local community we have spoken with has overwhelmingly opposed the palm oil companies illegally destroying forests on their land, so the areas we are focussing on will be around those communities. The best outcome we can hope for is these communities will have their rights preserved and their forests retained as a result of the student detected illegal interference – if that is their choice. The role of young people here is simply to provide help to those who really need it – and to give them back a voice. The number of enrollments we have already queuing up from schools across the planet is astounding and very encouraging. You will see footage soon of villages literally begging for their help – it is a truly moving scene to see so many people having their lives destroyed so senselessly. If we can empower even one village through this program it will be a success. Our goals are much loftier than one village of course. We have to finish the beta pilot and complete a little more software development before we can put more tangible metrics around this aspect of the project. Ps. Not grey blurs. But, the images won’t be photographs, they will be radar images, which adds a whole layer of learning around how data is obtained, displayed and analyzed. Not quite as visually pleasing as seeing treetops close up with optical images, but possibly more pedagogically valid. I know it looks like gray blurs… hey, these ones are. so I understand your astonishment. the pictures sean used were part of a presentation and are meant to show the concept (black means deforested, white means forest). radar imagery can be shown black and white as it shows the reflectance of the radar beam and trees reflect differently from clear areas or water. Radar has evolved in the last years and satellite providers can collect data at 30, 12, 4 and even 1 meter resolution and a lot of information can be extracted. we are still busy developing the education and tutorial modules in order to students learn and work with such data. on top of that uneasy data layer (or rather below the radar data), we will use optical imagery. this can be up to 0,5 meter resolution. which allows students to actually see the trees they are protecting. The optical imagery will not be updated as frequently as the radar since it depends on clouds, contrary to radar (which goes thru clouds) the optical sensor captures clouds just like a photo camera.. and it is called a rain forest for a reason, so only once or twice a year we will be able to update the optical data. So it is really a great education initiative, coupled with ground transparency. since in the subsequent radar images, the students will know if their reports have been ignored or not and if the deforestation stopped or not. so they will be able to tell if the agreements with the local police and local government are being respected or not. either way, the local truth and developments will be unveiled. Sorry Sean, but you didn’t answer my question: what are the expected results on deforestation and local communities? I found a partial: ‘If we can empower even one village through this program it will be a success. Our goals are much loftier than one village of course.’ One village being watched over by students from all over the world is considered a success? It sounds rather Orwellian: big brother is watching you. What are your goals, and how does the software support them? Eduardo and Sean, you do a great sales pitch but where is the product? Sean claims ‘radar images are the only option’ (Sep 29), while Eduardo claims ‘below the radar data), we will use optical imagery’ (Oct 3). Sean presents some blurry shades of grey earlier, but now both of you are arguing it’s gonna be something very different. You announced the launch of this software over 2 moths ago, so you should have some pretty good examples of what the images students will work with look like. Can you upload one or provide a link? I am not trying to sell you anything. Simply answering your questions. The answer to what do we expect is: to create awareness and transparency to the reality of what is happening on the ground, to provide real, engaging learning experiences for young people across the planet, and to help stop more deforestation. I assume you are asking me for projections on the latter, but I am not comfortable putting metrics around it at this point. Some other members of the team are preparing a report with maps, overlays and images to show how the pilot has gone, to explain in which ways it has been a successful proof of concept. The image issue is very simple. Students will be using radar data (call it images if you prefer but images are just a representation of data.. So either way) to compare information over time. The underlay map is optical and is not current or even recent data in many cases. Just like the mapping software you use when you use Bing or Google maps, or any other.. (They are several years old in many places). It is simply to help young people make connections. Eduardo will create you a demo account and assign you a patch of land. Unfortunately we are not taking new users into the beta trial and we have a wait list that is extensive, but the demo will help you understand the concept. keep an eye out in your inbox over the next few days. What is your email address so that I can email you the link to the demo account? (you can drop me a direct message in facebook if you prefer to writing it here). 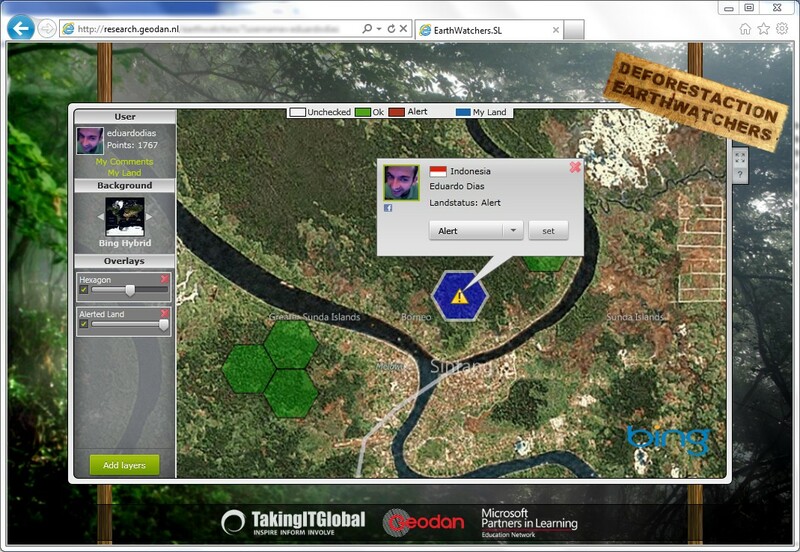 this webtool intends to allow students to monitor the forest. it will also include the borders of existing concessions (for legal palm oil or logging). so the students will be able to see if there are big cuts in forest areas out side the legal borders. they can also see if the companies stick to the borders, since that is often a complain from the local people, as some companies can cut more than they are allowed. As Sean said, radar is the only way to maintain frequent updates in the data, due to cloud coverage. But we can use optical data underneath (as recent as possible) to help the students understand the radar data. Since it is a very large area, we will need many students to cooperate and discuss to cover the whole area, and that is where it gets exciting. when they discuss online the events they see happening in the ground via the near real time imagery. they can use our online commenting mechanism (similar to facebook, and also have links to external resources). the students will be co-creating the learning content. Sorry for the late reply! LOL, I’m not phishing for a sneak peek of your software. Just trying to understand the process. From reading between the lines over the last few days, I think I figured out what you’re doing. Do correct me if I’m wrong! The images for students are similar to those on the top of this page. You then use your ‘3 Terrabytes of Azure hosting per month’ (Sean Sep 29) to identify changes in tree cover from radar data (similar to NOAA’s hotspots). You then ask students to compare the “spots” in their hexagons against other data to determine if it’s legal. the software has been launched (check the event here: http://eduardodias.posterous.com/eartwatchers-launch-in-brisbane, but it is in a beta stage to get feedback and we are giving priority to schools. It is just important that we get feedback from the right target. Nevertheless, since you are very interested and giving loads of feedback also, I don’t mind giving you access to it for review. Please drop me a line as I can’t post access here. Regarding the process, what you describe is more sophisticated than what we need. The way I understand it, the NOAA hotspot analysis is based on modeling and computation to determine the bleaching spots. They use historical data (for the last 20 years or so) to determine trends and find current hotspots. In EarthWatchers, time is of the essence and we are looking for real time intelligence of deforestation activities happening in real time. So we need data from last week and this week to “see” if something has changed. Because there has been a lot of good work on reporting the trends and modeling deforestation, it is a well-documented phenomenon from different parties (world bank, NGOs, etc). who have delivered very accurate technical information that is being used for decision making from a strategic perspective (and creating instruments as REDD, National parks etc). Still, the illegal activities continue and the local authorities lack resources to keep such large areas under surveillance. So this is a key component of our system that we have secured ground dynamics (with the eco-warriors) and partnerships with the local authorities who agreed to act based on the geographical advice from the EarthWatchers. It is a partnership between the children of the world and the local authorities in Sintang. This will also give extra incentive to the local authorities to act as the world is watching and helping. Regarding the definition of illegality, we have received from our partners at the ministry of forestry the locations of the legal palm and rubber concession areas on one side and the forest classification layer on the other hand. So the earthwatchers are monitoring just the protected forest (outside the concessions) also they can “keep an eye” on concession activities to see if they stick to their legal borders. So the system is indeed simple, but I believe that its simplicity is also its biggest strength. Thanks for your reply Eduardo. Your faith in the data from government and other parties is cute, but misplaced. There’s a long story there why these datasets are so inaccurate, and I won’t bore the readers. But I can almost guarantee you that your great initiative is gonna hit serious frustrations in 6-12 months after the start. So I suggest you PM me. This site registered my email address, so you should have easy access to it. Let me share with you the great news that our application was awarded a very important prize in the satellite world. We won the GMES (Global Monitoring for Environment and Security) Master competition (see page 4: http://www.gmes-masters.com/livebook-results/). GMES is the most important satellite program from the European Commission. Although there were more than 100 entries, our EarthWatchers application stood out. The jury classified it as a radical new approach to data process and one of the criteria was the feasibility of the concept. So the very advanced monitoring and satellite community are supporting us also. And I believe this is exactly what the world needs: Positive support, new ideas and alternatives that can make a difference. You will be able to subscribe for an account soon as all the other people who are interested in monitoring and checking the forests in Borneo.